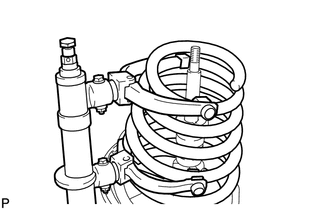 (a) Install the rear lower coil spring insulator onto the rear shock absorber assembly. 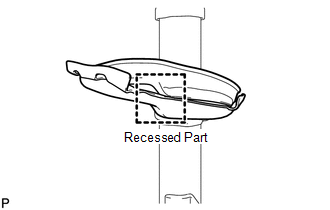 Fit the recessed part of the rear lower coil spring insulator into the recession on the shock absorber assembly. (a) Install the rear No. 1 spring bumper to the rear shock absorber assembly. 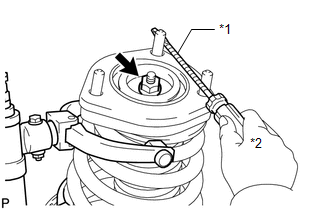 (a) Using SST, compress the rear coil spring. Do not use an impact wrench. It will damage SST. (b) Temporarily install the rear coil spring together with SST to the rear shock absorber assembly. 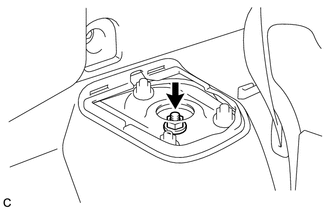 (a) Install the rear suspension support assembly to the rear shock absorber assembly. 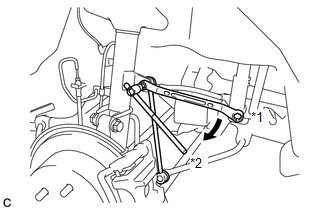 Align the cutout on the rear shock absorber assembly with the protrusion on the rear suspension support assembly by referring to the illustration. 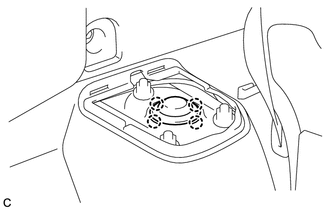 (a) Install the rear support to rear shock absorber collar to the rear shock absorber assembly. 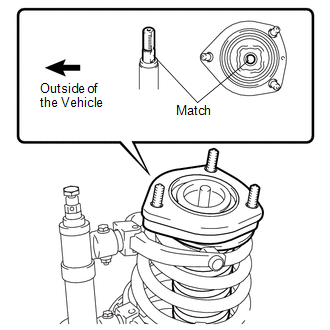 (a) Using a screwdriver or an equivalent tool to hold the rear suspension support assembly, temporarily install a new rear support to rear shock absorber nut to the rear shock absorber assembly. Use a new rear support to rear shock absorber nut. Tape the screwdriver or the equivalent tool before use. (a) Install the rear coil spring. 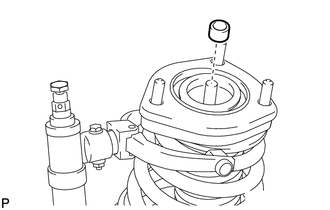 Make sure that the end of the rear coil spring is positioned in the depression of the rear lower coil spring insulator. 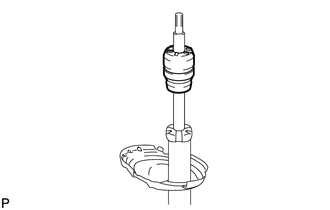 Ensure the rear lower coil spring insulator is not pinched or folded over and caught by the rear coil spring. 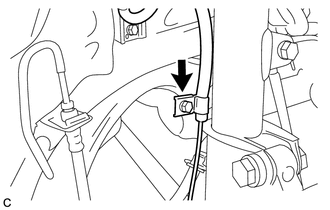 Ensure that the stud bolt is positioned 3.5° to the outside of the vehicle as shown in the illustration. The deviation should be within +/- 5°. 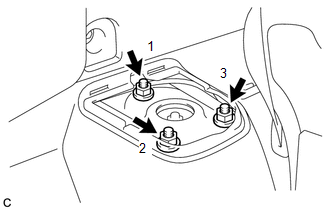 (a) Install the rear shock absorber with coil spring with the 3 nuts in order 1 to 3. 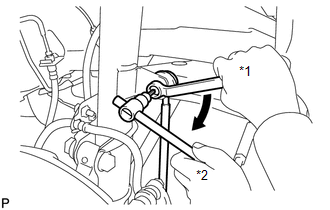 (b) Install the rear shock absorber with coil spring with the 2 bolts and 2 nuts. When installing the nuts, keep the bolts from rotating. (c) Fully tighten the rear support to rear shock absorber nut. (a) Install the rear No. 1 suspension support cover. 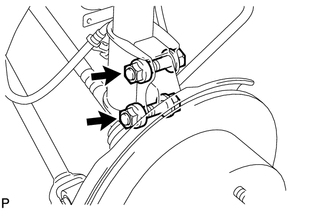 (a) Install the rear stabilizer link assembly to the rear shock absorber with coil spring with the nut. 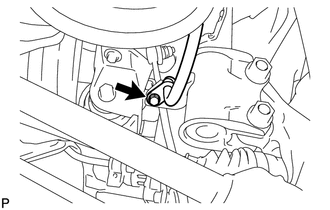 (a) Install the rear speed sensor wire to the rear shock absorber with coil spring with the bolt. 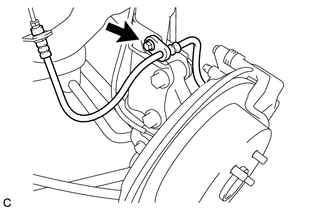 Do not twist the rear speed sensor wire when installing it. 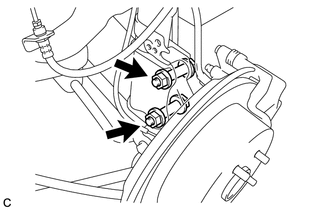 (a) Install the rear speed sensor to the rear shock absorber with coil spring with the bolt. 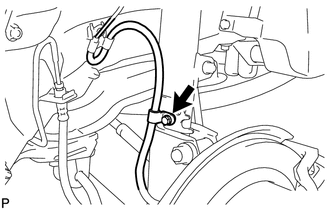 (a) Install the rear flexible hose to the rear shock absorber with coil spring with the bolt. Do not twist the rear flexible hose when installing it. (a) Engage the 5 claws to install the deck side trim. 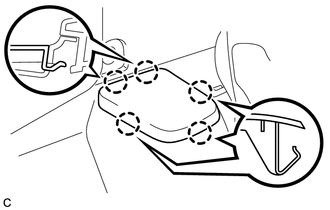 (a) Inspect and adjust the rear wheel alignment (See page ).